Backyard Blueberries: Almost ready for picking! 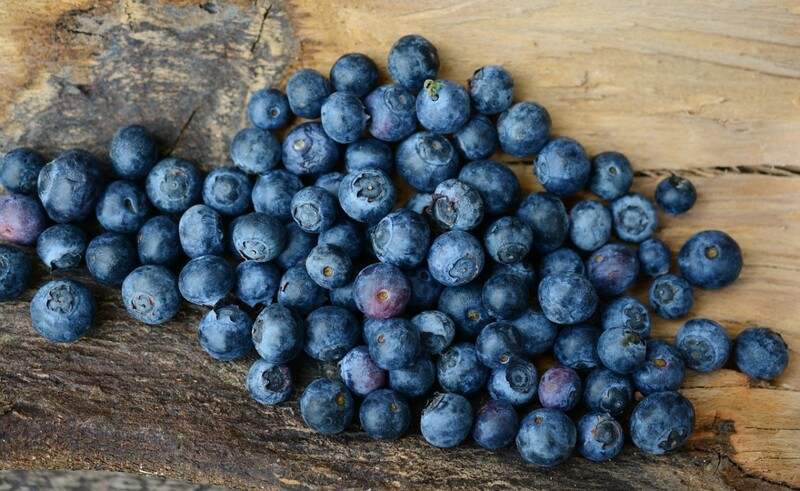 Blueberries might be the perfect choice for growing fresh fruit in the backyard garden. 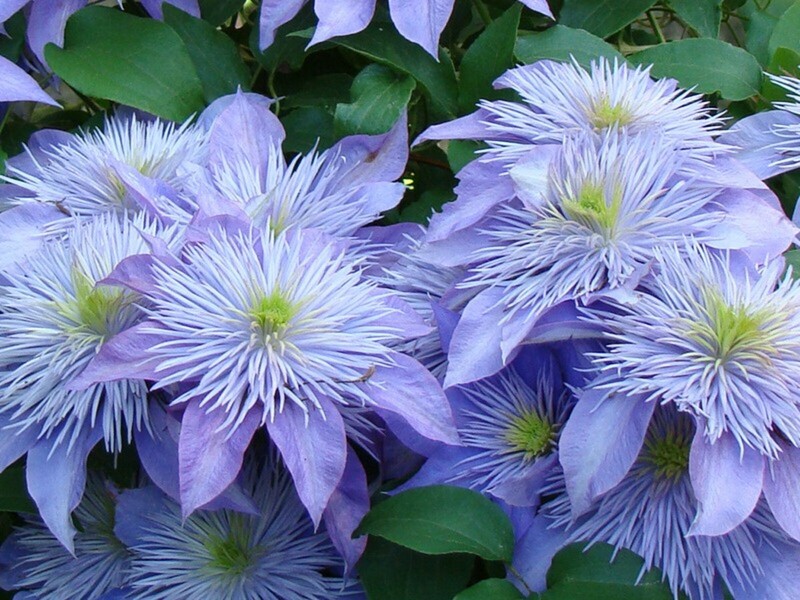 Hardy and easy to grow in northern gardens, the bushes are attractive landscape plants. As an added benefit, established bushes produce reliable crops of delicious berries every summer. 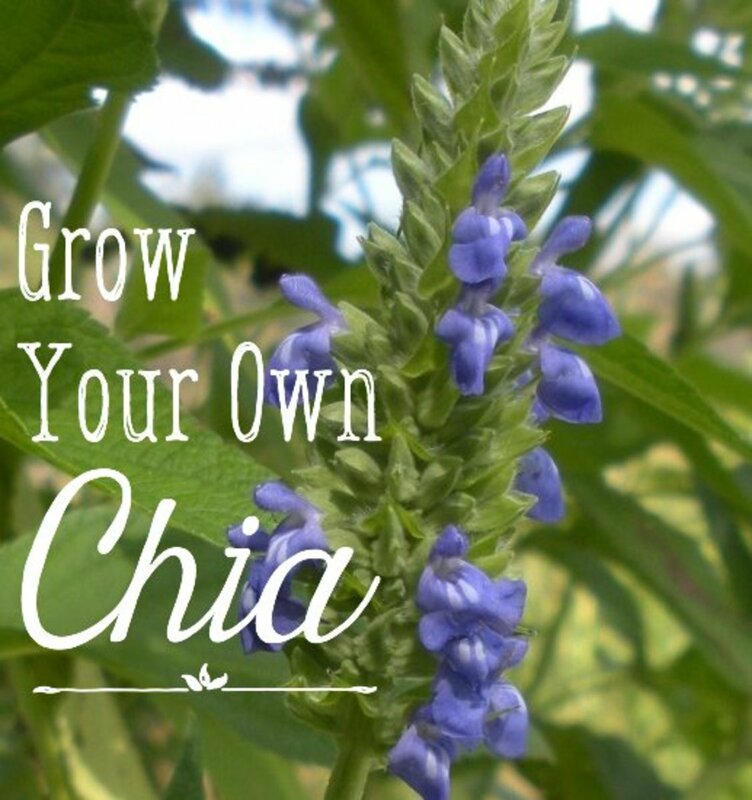 The plants are also versatile, and can be grown in the ground or in containers. By following a few basic steps for planting and caring for them, the reward is many years of picking a bounty of fresh, delicious and nutritious fruit in your backyard. Native to North America and offered through nurseries and online retailers, blueberry plants are available in many different varieties with different cultivars producing fruit in early, mid and late summer. Berry size varies with different varieties, with some types bearing large fruits that are perfect for pancakes and pies. Other varieties produce a smaller, firmer crop for muffins and breads. Planting several varieties ensures a steady crop of fresh fruit throughout the growing season. Look for varieties that are adapted to your local climate. There are warm-weather cultivars as well as plants that are at home in colder northern climates and can withstand winter's freezing temperatures. 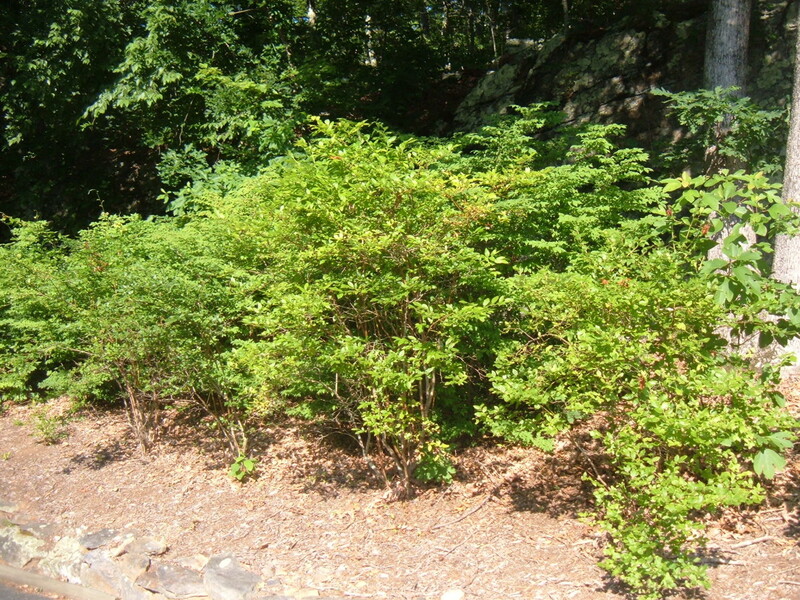 Always plant more than one variety of blueberry bush. Though some types of are self-pollinating, planting at least two different varieties encourages cross-pollination and leads to larger fruit crops. Though blueberries are easy to grow and established plants require little care, getting the plants off to a good start requires selecting the right growing location. They require full sun, well-drained soil and a low pH between 4.5 and 5.5 to grow healthy, fruit bearing plants. Select a sunny location with good drainage for growing your plants. 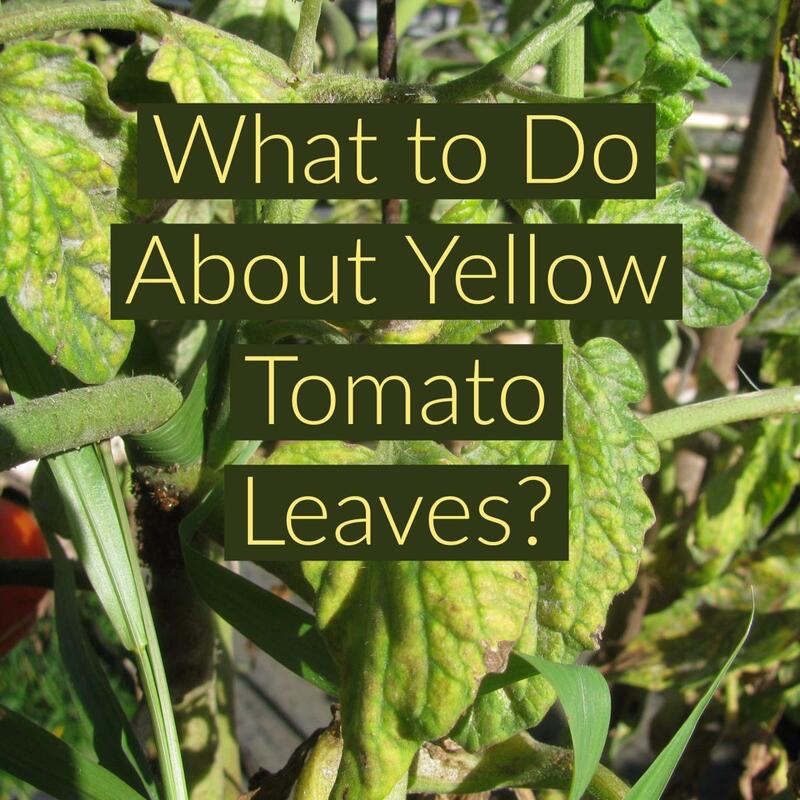 They thrive in moist soils, acidic soils but they will not do well in wet or soggy ground. Because of their appetite for acidic soil with a low pH, growing several plants in a raised bed makes it easier to adjust the soil to their specific needs. Growing plants in containers or large tubs is another way of providing a specialized growing environment. We grow several different varieties of blueberries in two separate planting beds. 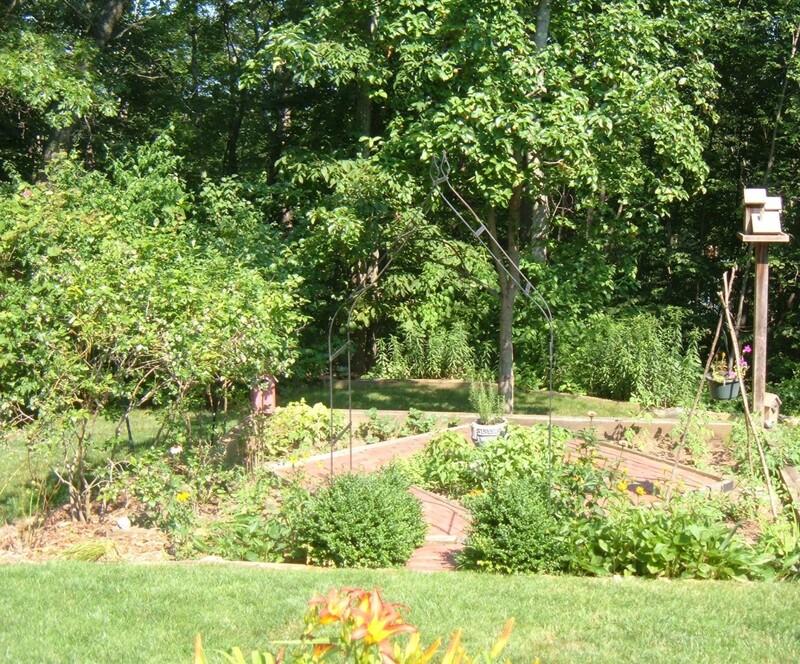 The row shown here form a line along one edge of our driveway, featuring nine different plants and representing three or four different varieties. Surrounded by mature oak trees, the planting bed is mulched with a combination of leaves and wood chips. Most of the plants are about ten years old, and produce a large crop of berries every summer. Behind the row is a complimentary planting of several large Burning Bush shrubs. In the fall, the leaves of the blueberries and the burning bushes turn several shades of crimson red, creating a colorful display against the granite ledge in the background. 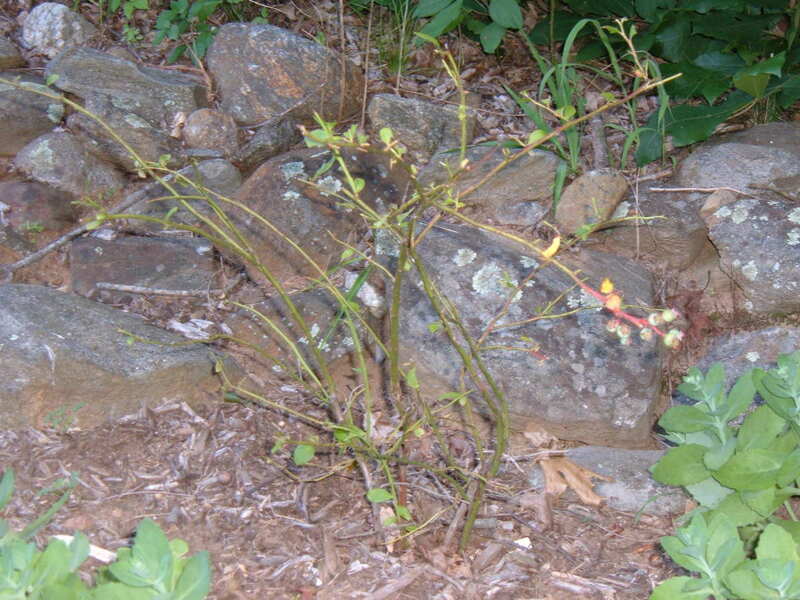 Spring is the best time to plant a new blueberry bush. Dig a hole twice as deep and twice as wide as the nursery pot, and amend the soil with compost. Test your soil to determine the pH level and if needed, add peat moss or a fertilizer formulated for azaleas. Mulch the planting bed with 3 to 4 inches of wood chips, and keep the new plant well watered until it becomes firmly established. They have a shallow root system and the mulch helps to retain moisture while inhibiting weeds. The plants are fast growers, and begin to produce fruit in their third or fourth year of growth. 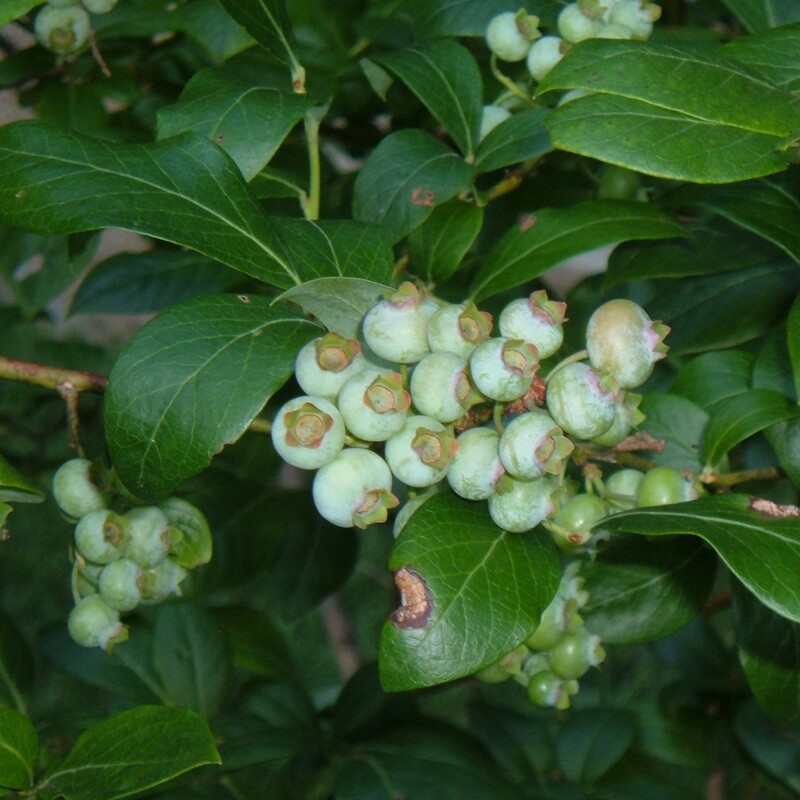 Maturing bushes require very little care, but will benefit from a light pruning in late winter and an annual dose of fertilizer in early spring. 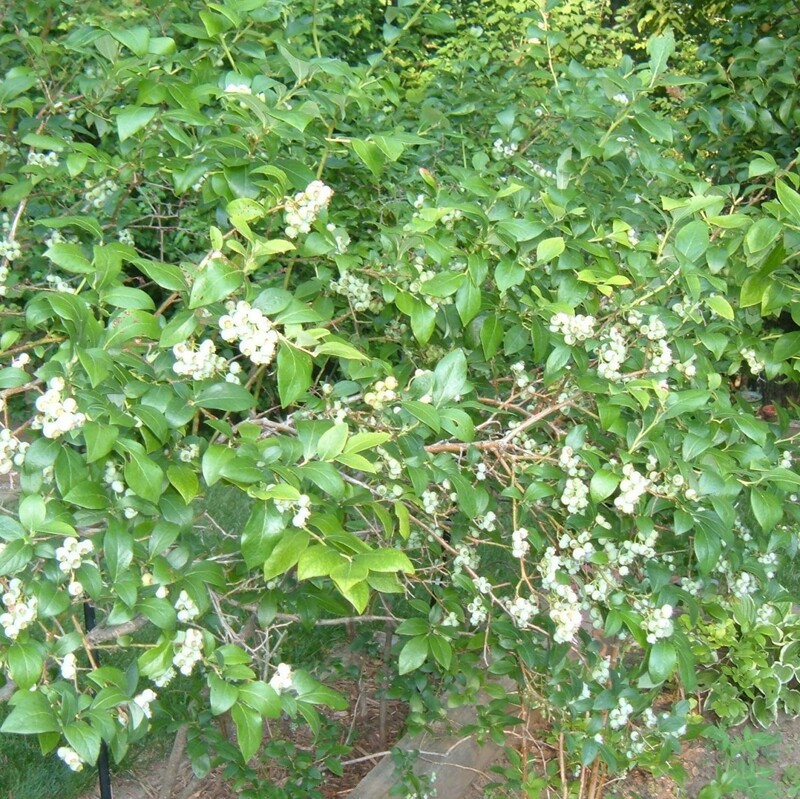 To prune a bush, cut away any dead limbs or broken branches while the plant is still dormant. Thin out any old growth to increase air circulation and to make room for new, vigorous branches to grow. Prune any crossing limbs, and lightly trim the bush to retain its upright shape and to control its overall height. 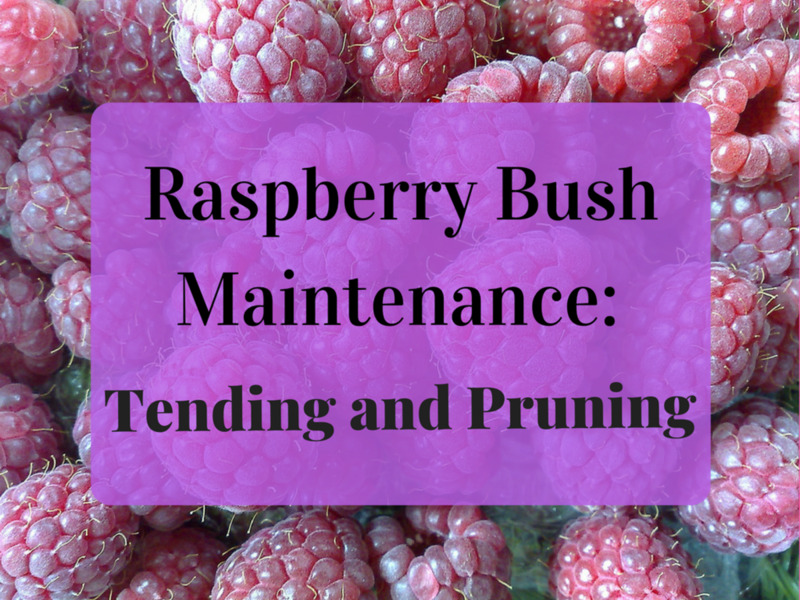 Don't prune the shrub after the plant begins to leaf-out or you risk cutting away the buds and bloom that will form this season's crop of berries. It's hard to beat the taste of a freshly picked blueberry! Depending on the variety, the crop begins to ripen in early summer. The clumps of greenish berries begin to turn reddish-purple, and the color deepens as the berry ripens. A ripe fruit is a lustrous deep purple, and a gentle tug is all that's needed to encourage the berry to release its grip from the plant. Shaking a branch lightly over a basket or sheet of newspaper will result in a pile of ripened produce. The fruit will continue to ripen for several weeks and in our area, we pick berries every few days from late June through early August. Planting several different varieties that ripen in early, mid and late summer extends the harvest season. Store your freshly picked berries in the refrigerator, and they will keep for several days. We sprinkle fresh ones in cereals, mix them into muffins and pancakes, and add them into fruit salads. Garden fresh blueberries also taste great on their own -- and even better when topped with a bit of whipped cream! Blueberries have few natural pests, but they certainly attract the attention of the local wildlife. Beginning in early spring when the bushes are covered in small white or pinkish flowers, hummingbirds and bees gather nectar from the bell-shaped blooms. Bluebirds also visit the blooming shrubs, plucking flowers for an early spring snack. As the berries ripens, the bluebirds return along with robins, jays and a host of other feathered friends. Squirrels and chipmunks climb through the branches in search of ripe berries, and even our flock of backyard chickens scratch around the planting beds in search of fallen fruit. Deer don't seem to bother with them, but my daughter's goat reduced the small plant in the photo to a pile of barren twigs. Some growers enclose their patch with fencing to protect their crop. Specialized bird netting is another effective barrier, draped over the plants just before the berries begin to ripen. We just share our berries with the birds: our solution required planting more bushes. With fifteen shrubs growing in two separate planting beds (not including the poor bush plundered by the goat), there's usually enough fresh berries for a tart or another batch of pancakes. 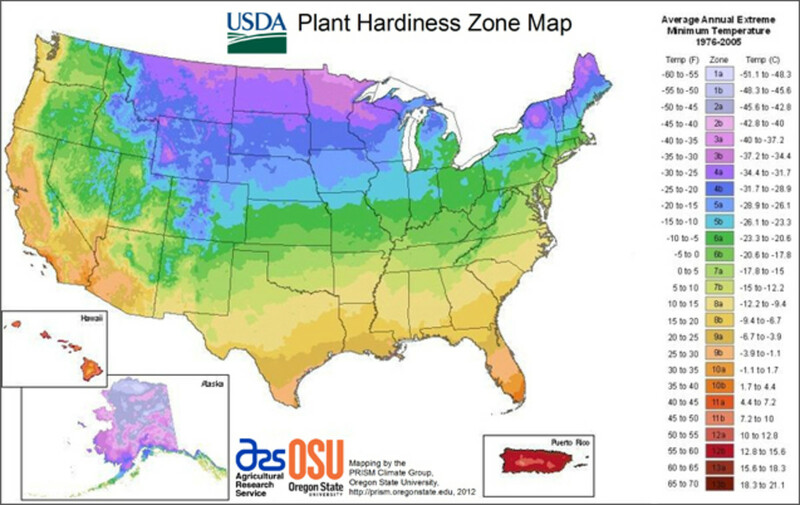 Grow varieties that are suited to your climate. Plant several varieties to ensure proper pollination and a plentiful bounty of fruit. To extend the harvest season, plant different types that produce fruit in early, mid and late summer. The fruit are very high in antioxidants. They are also high in vitamin C and a good source of vitamin E.
They are one of the only natural foods that are actually blue in color. 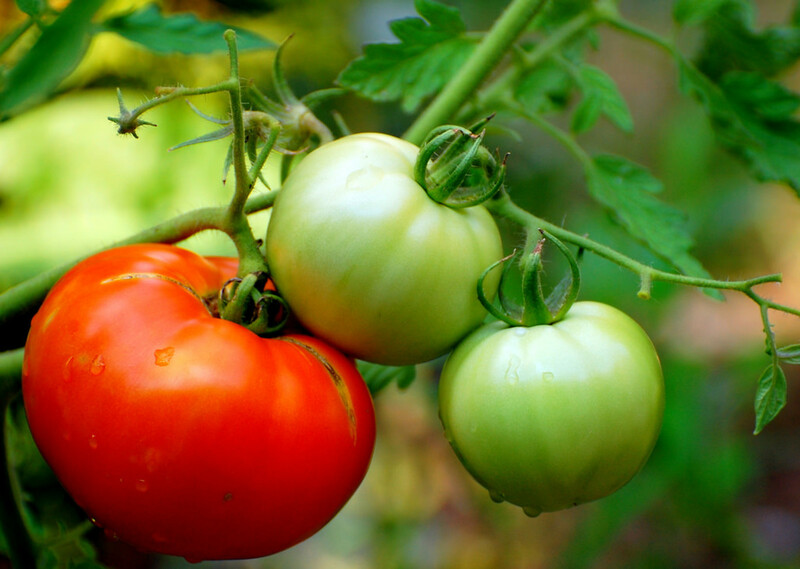 Store fresh crops in an open container to reduce condensation, and keep in the refrigerator. Do not wash freshly picked crop until just before serving. Freeze fresh blueberries! Place unwashed ones in a single layer on a sheet tray, and place in the freezer. Store frozen berries in a plastic storage bag. Native Americans called them "star berries" because the shape of the flower resembles a star shape. Can You Grow Them Where You Live? Share with the birds, but save some for yourself! Protective netting to help reduce the number of blueberries eaten by the birds. Do You Grow Fresh Blueberries? What’s a natural organic fertilizer for blueberries? Blueberry bushes do not grow well if the pH of the soil is too high. Granular sulfur mixed into the soil will lower the pH, though some gardeners just add used coffee grounds. I planted a blueberry bush in 2013 and this year had a few new branches. I've had a hard time keeping it going, although this fall it has seemed to perk up. Here's hoping for a better 2015. I have a blueberry bush growing in a large pot. It has borne fruit for the past few years - albeit a little small - but nevertheless still quite delicious. I think it deserves a new pot next year. The PH is a little high here, but I sure do like them. I plant to try again in the spring. I'll have to make the soil more acidic though.